The show focuses on the entire product development life cycle. It brings over 10,000 global industry professionals together with more than 600+ suppliers through exhibitions, education, workshops, partnering opportunities, and networking events. Whitehouse Laboratories, A Division of Albany Molecular Research Inc., is excited to announce that it will again exhibit and participate at INTERPHEX 2016. Sponsored by the Parenteral Drug Association (PDA), the New York Interphex Show will open on April 26th and run through April 28th. With over 12,000 industry professionals in attendance and more than 600 exhibitors, the educational and networking opportunities are extremely valuable. INTERPHEX is viewed as the key show for all of the latest information on new products, technologies and other key developments surrounding the bio pharmaceutical industry. Interphex rewards attendees with a full agenda that includes exhibitions, technical education sessions, workshops, partnering opportunities, and networking events. Exciting show features such as the Pharmaceutical Technology’s Keynote Series, INTERPHEX LIVE, INTERPHEX Exhibitor Awards and the 3D Printing education/demo forum make this conference a can't miss destination. Registration can be completed at the following link. INTERPHEX (International Pharmaceutical Expo), sponsored by Parenteral Drug Association (PDA), is the single source for complete biopharmaceutical development and manufacturing solutions to safely and cost effectively process all dosage forms for life-enhancing drugs. It brings over 12,000 global pharmaceutical and biotechnology professionals together with 600+ suppliers via 300,000 sf of event space through a unique combination of exhibition, education, workshops, partnering opportunities, and networking events. 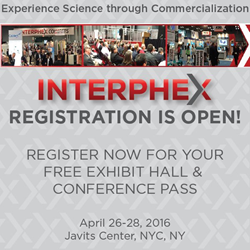 INTERPHEX offers annual national and international industry events and educational opportunities around the world.